I've had two main challenges in all my homes: making small rooms feel larger, and making sense of secondhand purchases. My approach to both is using a few key colors that flow throughout the whole house. Bold transitions, while dramatic, can make a small house feel choppy. Sticking to a whole-house palette helps me edit random yard sale purchases. Another benefit: if you move often, furniture can easily switch from room to room. You may already do this without even thinking about it. 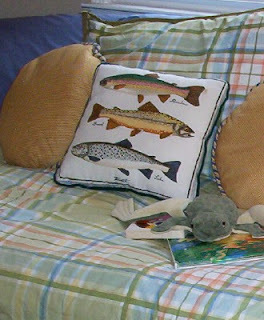 Our son's room uses a plaid comforter with the soft colors of nature. You saw our bedroom last week. 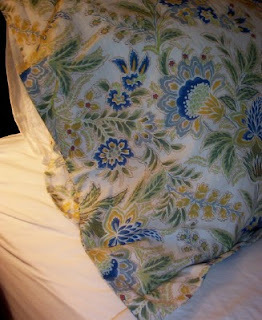 Now I understand why I instinctively grabbed those shams! 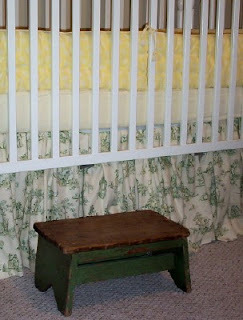 Our little girl's colors are interpreted in a gardeny green toile with yellow bumper. I so much agree with the color throughout the house. When I was growing up, the dining room and living room opened off of each other. The were painted garishly different colors and it assaulted the eyes! Here's a nice trick for those of us who aren't "naturals" at using color as Meredith so gloriously seems to be. I wanted to have a cohesive color scheme when we moved to this house, but it was so much larger than our first that I knew it would be underfurnished for a while. I wanted paint colors to set the tone but didn't know where to start. Luckily, the Martha Stewart paint collection made it easy. The color chips are in sets of four colors that don't necessarily "match" but work great together when used for wall color, furnishings, accessories. I found a set that included colors I already had and it turned out great. Beautiful colors! Your home looks so warm and Springy!